SKIMFLOW® NP (No Prep) is a hybrid cement self-leveling underlayment designed for time sensitive projects, where compromised substrates make shrinkage undesirable. SKIMFLOW NP offers no-shrink, no-profile, technology to fast-track jobs, without sacrificing performance. Reference the floor covering and adhesive manufacturers documentation to verify suitability of SKIMFLOW NP as a subfloor for the flooring system (any adhesive used for concrete is generally suitable for SKIMFLOW NP). Follow the directions of the flooring and adhesive manufacturer to determine the maximum allowable moisture content (RH) or transmission of the substrate. If the moisture content (ASTM F-2170) or moisture vapor transmission rate (ASTM F-1869) of the substrate exceeds the requirements of the flooring system, utilize VAPORSEAL HM prior to installation of the SKIMFLOW NP. Honor all moving joints. Complete crack and substrate repairs prior to installation. Consult an engineer for required joints and crack repairs prior to installation. Contact Technical Services for required surface preparation on installations that will be exposed to high rolling loads or high point loads. Maintain a minimum of 50ºF during the pour and for 72 hours after the pour. Acclimate the material to a minimum of 50ºF prior to mixing. To maximize flowability and working time, utilize cool water when temperatures exceed 85ºF. For installation over hydronic heating systems utilize a minimum of 1.5” of material, with ¾” of material above the hydronic system. SKIMFLOW NP is compatible with and accepts the direct application of, urethane, moisture cure and other typical floor covering adhesives. SKIMFLOW NP can be applied in two lifts to a maximum depth of 3”. Contact Technical services for 2 lift application methodology. All Substrates must be sound, clean, dry and free of contaminants (oil, dirt, laitance etc.) that may interfere with adhesion. Areas of the floor that do not exhibit a tensile pull strength greater than 100 psi are not suitable and must be mechanically removed to a sound, stable base and subsequently repaired prior to application of SKIMFLOW NP. Do not use solvents, acids, chemical adhesive removers to prepare the substrate. All bond breaking substances (cure residues, excess salts from silicates etc.) must be removed prior to priming. Completely vacuum all dust and debris from the substrate prior to priming with designated Dependable primer. Gypsum substrates must exhibit a sound surface, be dry, free from dust and surface weakness prior to application of the primer. Non-soluble adhesives must be scraped to a well-bonded residue. Water-soluble adhesives must be removed mechanically to the substrate. Verify type of adhesive prior to mechanical removal to ensure adhesive containing asbestos is not introduced into the environment. Follow all local, state and federal laws for removal and disposal of adhesive or flooring materials containing asbestos. SKIMFLOW NP is not for use as a suitable means to encapsulate residue of hazardous materials. Wood floors must satisfy local building codes, utilize exterior grade plywood, suitable OSB or other resistant to water, and be free from deflection. The wood must be free of contaminants (oils, wax, dirt etc.) that could function as bond breaker prior to application of the primer. Wood floors that exhibit extreme deflection require the use of reinforcing lath, contact technical support for details. Prime all surfaces with PRIMER A™ prior to application of SKIMFLOW NP. Reference instructions on the respective data sheets. Following priming and prior to material mixing and application, seal all voids around pipe or conduit intrusion (plumbing and electrical penetrations), walls and otherwise with rapid setting patch or foam insulation. SKIMFLOW NP is very flowable and will flow through any open voids. SKIMFLOW NP has tremendous bonding properties, place tape or bond breaker on vertical surfaces that will contact the SKIMFLOW NP. Provide a barrier between SKIMFLOW NP and metallic construction (e.g. heating pipes), which can lead to corrosion. When applying SKIMFLOW NP on Wood substrates, a reinforcing lath may be required depending on the deflection on the substrate. Shut down HVAC units off for installation and the first 16-24 hours of material cure. Maintain air circulation to assist in drying, however avoid direct airflow across the surface of the material for 16-24 hours. Avoid direct exposure to direct sun or wind during the application. Mix Time: 2.5 minutes with 850 – 1200 rpm drill or through pump. Over watering and/or under mixing (failing to generate adequate shear) will result in lower ultimate compressive strengths. For applications beyond 3/4” utilize the low water range. Segregation of sand during placement indicates over watering. Add designated clean, potable water to a clean mixing barrel, add the powder and mix at the designated speed for 2.5 minutes. Ensure all material is homogenous, and no dry lumps or unmixed material is at the bottom of the mix. During mixing, keep the paddle below the surface of the material to reduce introduction of excess air into the mix. Once mixed, pour onto the substrate immediately to maximize material flow and placement time. SKIMFLOW NP may be mixed and/or pumped with most standard batch or inline mixing/pumping equipment. Contact Dependable Technical services for pump questions. Immediately after mixing is complete pour the mix on the substrate, rake to the required depth and smooth using appropriate tools (smoother or porcupine roller). When placing mixed material, maintain a wet edge, always pouring back into the leading edge of the previous placement. Do not used forced air to assist in drying SKIMFLOW NP, but do provide for adequate ventilation and circulation of air. SKIMFLOW NP generally hardens to accept light foot traffic 2-2.5 hours after placement. Avoid construction traffic for a minimum of 16 -26 hours (temperature dependent). SKIMFLOW NP is self-drying, do not wet cure or use curing or sealing compounds. To facilitate drying, ensure rooms where SKIMFLOW NP is installed have air circulation. Do not introduce heavy airflow to the surface of SKIMFLOW NP until after 16-24 hours of drying. Temperature, humidity and airflow will impact drying time. The use of a moisture meter is recommended to verify readiness for flooring. Multiple areas should be surveyed to ensure dryness throughout. Use of a Delmhorst G-79 and a reading of 5% moisture content or lower, or a GE® Protimeter moisture meter such as the Surveymaster or Aquant. In the RF (Radio Frequency) mode a ready of 180 or lower indicates suitable dryness for any floor covering. • Breathable Flooring Systems: For applications up to ¼”, install breathable flooring systems after 16 hours. Add an additional 24 hours of dry time for EACH additional ¼ inch of material. • Non-Breathable Flooring Systems: For applications up to ¼”, install non-breathable flooring systems after 36 hours. Add an additional 24 hours of dry time for EACH additional ¼ inch of material. Wash hands and tools with water before the material hardens, or within 10 minutes of material contact to ensure easiest removal. Cured material must be removed mechanically. Dispose waste or excess material in accordance with all local, state and federal regulations. Hardened material is generally considered construction waste. Store in cool and dry conditions, out of direct sunlight with pallets wrapped in original shrink-wrap. • Do not use where hydrostatic pressure is present or moisture emissions exceeds level permitted for an installed floor covering. 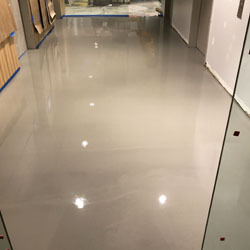 SKIMFLOW NP Underlayment can tolerate any amount of moisture from a concrete slab so long as all of the moisture from the slab will escape past the floor covering. If the floor covering’s moisture permeability does not meet or exceed the moisture content of the slab, Dependable recommends moisture remediation. Use Dependable’s Vaporseal HM, or an approved alternative, to remediate moisture in concrete, consult the Vaporseal HM data sheet, or call technical services, for more details.